Alvin was designed as a replacement for bathyscapes and other less manueurable submarine vehicles. Its more nimble design was made possible in part by the development of syntactic foam, which is buoyant and yet strong enough to serve as a structural material at great depths. The vessel weighs 17 tons. It allows for two scientists and one pilot to dive for up to nine hours at 4,500 metres (14,800 ft). 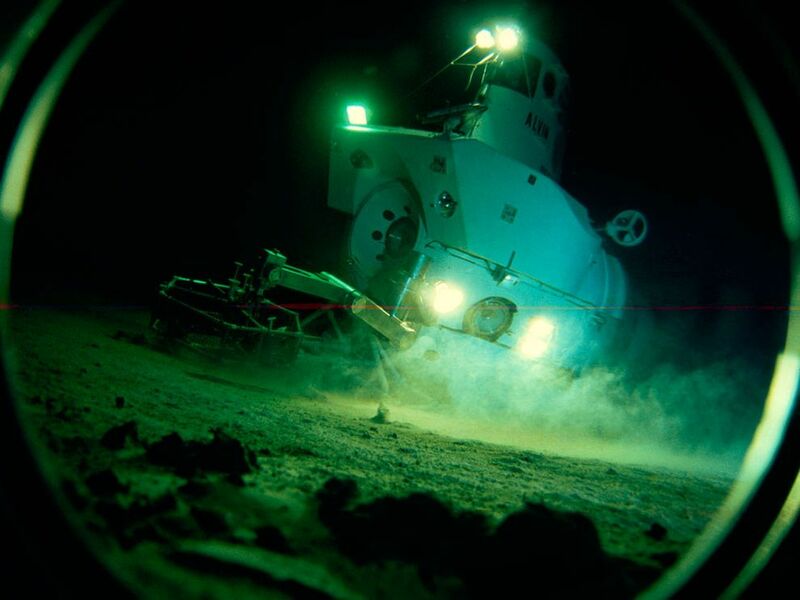 The submersible features two robotic arms and can be fitted with mission-specific sampling and experimental gear. The hatch of the submarine is 0.48 metres (1 ft 7 in) in diameter and somewhat thicker than the 2 inches (51 mm) thick titanium sphere pressure hull; it is held in place by the pressure of the water above it. 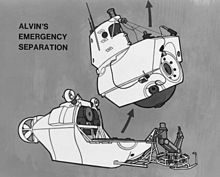 As explained during its search of Titanic, in an emergency if Alvin is stuck underwater with occupants inside, the outer body of Alvin is able to come apart and the titanium sphere would then rise to the surface uncontrolled. It is unknown, however, if a human could survive the rapid trip to the surface. Alvin, first of its class, was built to dive to 2,440 metres (8,010 ft). Each of the Alvin-class DSVs have different depth capabilities. However Alvin is the only one seconded to the NOAA, with the others staying with the US Navy. Alvin's first deep sea tests took place off Andros Island, the Bahamas, where it made a successful 12-hour, unmanned tethered 7,500-foot (2,300 m) test dive. Alvin now had two pilots, Rainnie and Marvin McCamis, and on 20 July 1965 they made their first 6,000-foot (1,800 m) dive for the Navy to obtain certification." On 17 March 1966, Alvin was used to locate a submerged 1.45-megaton H bomb lost in aUS Air Force mid air accident over Palomares, Spain. The bomb, found resting nearly 910 metres (2,990 ft) deep, was raised intact on 7 April. On 6 July 1967, the Alvin was attacked by a swordfish during dive 202. The swordfish became trapped in the Alvin's skin, and the Alvin was forced to make an emergency surface. The attack took place at 2,000 feet (610 m) below the surface. The fish was recovered at the surface and cooked for dinner. Sinking Alvin, aboard the Navy tender ship Lulu, was lost as it was being transported in October 1968. Lulu, a vessel created from a pair of decommissioned U.S. Navy pontoon boats with a support structure added on, was lowering Alvin over the side when two steel cables snapped, while Alvin had three crew members aboard and the hatch open. Situated between the pontoons with no deck underneath, Alvin hit the water and rapidly started to sink. The three crew members managed to escape, but Alvin flooded and sank in 1,500 metres (4,900 ft) of water. Severe weather prevented the recovery of Alvin throughout late 1968, but it was photographed on the bottom in June 1969 by a sled towed by USS Mizar. Alvin was found to be upright and appeared intact except for damage to the stern. It was decided to attempt recovery; although no object of Alvin's size had ever been recovered from a depth of 5,000 feet (1,500 m), recovery was "deemed to be within the state of the art". 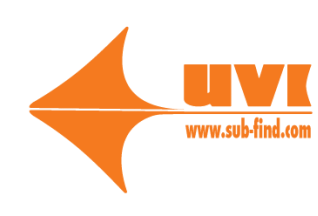 In August 1969, the Aluminaut, another DSV, descended to Alvin but had trouble attaching the required lines, and side effects from Hurricane Camille were producing worsening weather, causing the team to return to Woods Hole to regroup. The second attempt started on 27 August, and Aluminaut was able to secure a line and safety slings on Alvin, and wrapped a prefabricated nylon net around its hull, allowing it to be hauled up by Mizar. 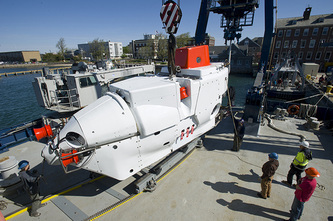 Alvin was towed, submerged at 40 feet (12 m), at a speed of 2 knots (3.7 km/h), back to Woods Hole. Alvin was so intact that lunches left on board were soggy but edible. This incident led to a more comprehensive understanding that near-freezing temperatures and the lack of decaying bacteria or fungi at increased depths prevented biological decay. Researchers found a sandwich which exhibited no visible signs of decomposition. This event led researchers to examine decay at extreme environments. The Alvin required a major overhaul after the incident. Post-sinking career - In 1973, Alvin's pressure hull was replaced by a newer titanium pressure hull. The new hull extended the submersible's depth rating. Black smokers - In 1977, during an expedition led by Robert Ballard and sponsored by NOAA, Alvin discovered and documented the existence of black smokers around the Galapagos Islands. Existing at a depth of more than 2,000 metres (6,600 ft), black smokers emit a strong flow of black, smoky water, superheated to over 400 °C (752 °F). Alvin was able to sample the water from a black smoker. Alvin discovered that the pH was roughly 2.8 (strongly acidic). Exploration of RMS TitanicMost famously, Alvin was involved in the exploration of the wreckage of RMS Titanic in 1986. Launched from her support ship RV Atlantis II, she carried Dr. Robert Ballard and two companions to the wreckage of the great liner.Titanic sank in 1912 after striking an iceberg while crossing the North Atlantic Ocean on her maiden voyage. Alvin, accompanied by a small remotely operated vehicle (ROV) named Jason Jr., was able to conduct detailed photographic surveys and inspections of Titanic's wreckage. Many of the photographs of the expedition have been published in the magazine of the National Geographic Society which was a major sponsor of the expedition. The Woods Hole Oceanographic Institute team involved in the Titanic expedition also managed to locate the wreck of the USS Scorpion (SSN-589), a Skipjack-class submarine armed with nuclear torpedoes, which sank off the coast of the Azores in 1968. Alvin was able to obtain photographic and other environmental monitoring data from the remains ofScorpion. Over the years, Alvin has undergone many overhauls to improve its equipment and extend its lifetime. In 2001, among other equipment, motor controllers and computer systems were added. The current Alvin is the same as the original vessel in name and general design only. All components of the vessel including the frame and personnel sphere have been replaced at least once. Alvin is completely disassembled every three to five years for a complete inspection. A new robotic arm was added in 2006. Current workIn June 2008 construction started on a stronger and slightly larger personnel sphere which may be used to upgrade Alvin (for use from 2011), before being used in an entirely new vehicle. 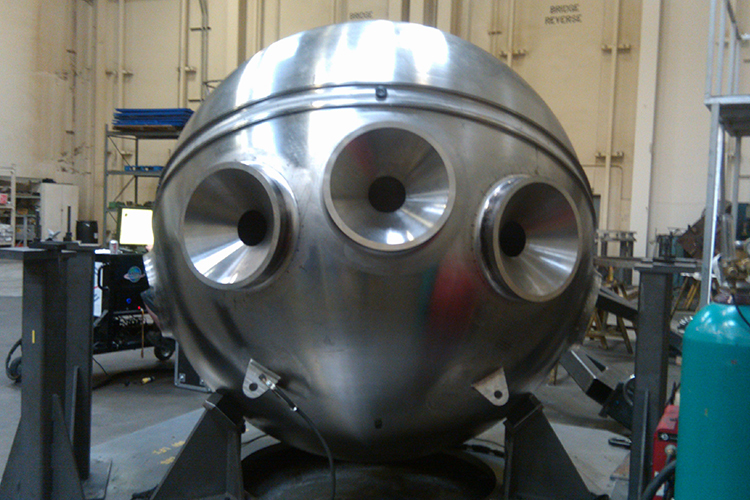 The new sphere, forged out of 15.5 tonnes of titanium, has five view ports (instead of the current three) and is designed for depths of over 6,000 metres (20,000 ft), where Alvin's constructed depth limit was 4,500 metres (14,800 ft). This, along with a general upgrade of support systems, instruments and materials, will allow Alvin to reach 98% of the ocean floor. After one last dive to assess damage to the Gulf of Mexico's seafloor after theDeepwater Horizon disaster, Alvin will be refitted starting January 2011, with an expected return to the ocean in 2012 and full depth potential achieved in 2015. A possible replacementOn 6 August 2004, the National Science Foundation announced the creation of a new Human Occupied Vehicle (HOV) to replace the aging Alvin. The new vehicle is being designed to dive deeper, up to 6,500 metres (21,300 ft) as opposed to Alvin's 4,500 metres (14,800 ft) and use new scientific equipment. The personnel sphere will be larger and it is expected that the battery capacity will be greatly increased enabling longer bottom times. The new deep sea submarine is in the preliminary manufacturing phases and is expected to be completed as early as the end of 2011. Some components of the current Alvin are anticipated to be used in the new Alvin replacement vehicle. Due to export laws, the vehicle cannot be sold to parties outside of the United States. 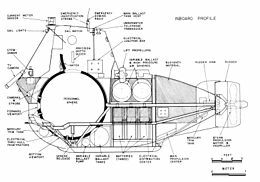 The fate of Alvin when this new submersible arrives is unknown, but due to the limited market for sale and stripping of components for use on the new vehicle, it will likely be placed in a museum. Contrary to a BBC article published in October 2004, the Alvin has not yet been retired from service. OperationThis section requires expansion. (June 2008)Alvin uses four 208-pound (94 kg) steel weights (~1.7 cubic feet of steel) to provide negative buoyancy for the trip to the ocean floor. Alvin contains a ballast and trim system, but the steel weights allow deep dives to be achieved more rapidly. These weights are jettisoned on each dive and left at the bottom.